Use the Winco PTCL-23B Brown Cover for Trash Can Winco PTCL-23B to keep your industrial garbage contained and concealed. When fitted tightly onto its matching can, this durable plastic garbage can lid keeps food scraps, packaging and offensive odors safely inside. 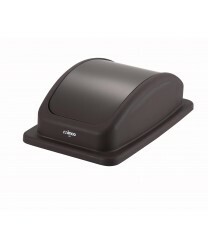 The chocolate brown lid is made of heavy-duty plastic, and it has a swinging door that is easy to open with one hand. Matching cans are sold separately as the Winco PTCL-23B.